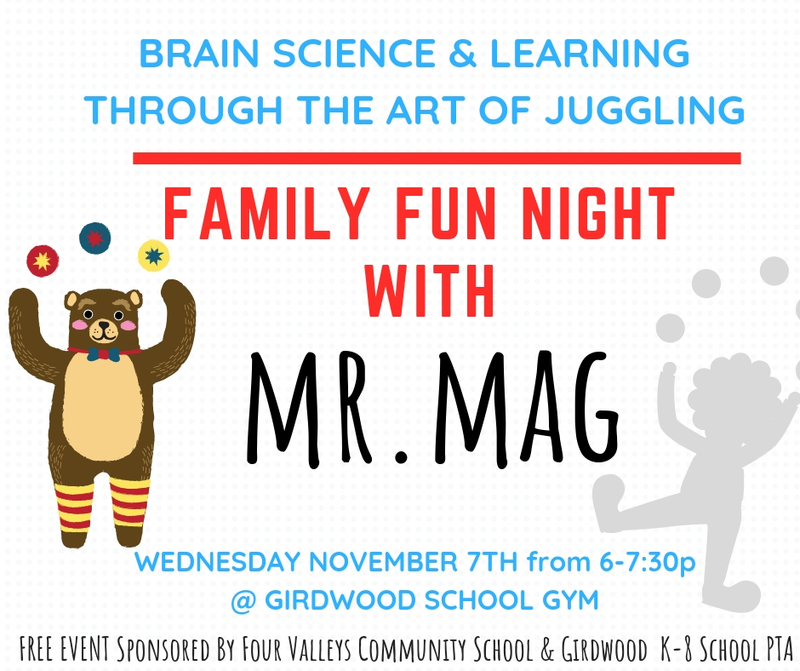 FREE Family Fun Night November 7th: Brain Science Through the Art of Juggling! Free family fun! 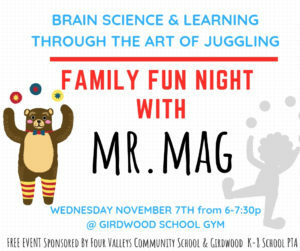 Mr. Mag is returning to the Girdwood K-8 School! Your child may remember him from last year when he taught all of us new and challenging juggling skills and activities. Mag is an engaging, inspirational, and FUN educator. He is coming to share his knowledge about brain science and learning through the art of juggling. He is magic with kids–capturing their attention with his big personality, encouraging manner, and goofy-yet-genius teaching methods. Mag will be working with individual grades during the day, and then we will be having a Family Fun Night from 6-7:30p in the Girdwood School Gym. Wear your gym shoes, and get ready to laugh and learn with your family. All ages, all family members, and all fun! Sponsored by Four Valleys Community School and the Girdwood K-8 PTA.